LEGO had to design their first Kylo Ren Command Shuttle set based upon what we can only assume was limited, early information. 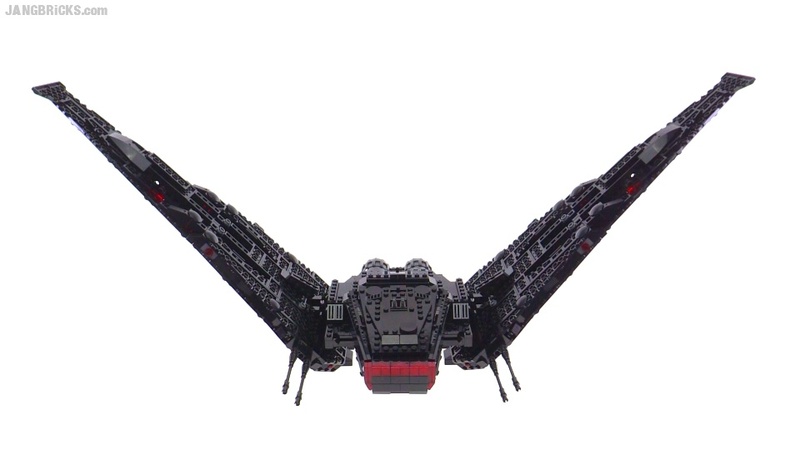 By September when the set was released, we consumers already had the benefit of some production renderings of the ship to refer to, and I quickly discovered an easy modification to allow the wings to fold as needed. After watching the movie today, I was inspired to immediately begin work on a couple additional modifications to make the model significantly more faithful to the fantastically evil beauty of a beast. Amazing modifications ! I like the black so much more than the original, though i haven't watched the movie yet. Bravo and dont' hesitate to post more pictures of your version, i'd be delighted to check out the details..! Hi there. Can you please email me instructions for this? It is amazing. I need to have one of my own! Email me instructions for this pls! Do you make or give out instructions for your mocs? I really like your version better! Do you make or give out instructions for your mocs? I really like your version of this ship better! Can you please email me the instructions for this ??? It's lovely :') so are you !! Do you send out any instructions for your mods? If so I would really love to have your instructions for this mod. Thanks! Hi. I am a huge fan of yours from Korea! I really love your version of the shuttle. Can I ask you to share instructions? Idk if the instructions thing happened but I watched your video and am considering modifying my model too! Awesome modifications, idk if the instructions thing happened but I watched your video on YouTube and think I'm gonna mod my model too! Hi This is really awesome! I'll be buying lego pieces today, and also wanted to recreate this for me and my kid. Can I ask for the instructions and list of pieces used for this please? Would really really appreciate it! Thank you sooo much! More power to you! Love your videos me and my son are big fans!! Anyway I could get the blueprints to this? maybe the parts list too? this is absolutely incredible! I have to build this! Can I get the instructions to this as well? The black version is way better than the original! My email is jedisalm@icloud.com. Can I please have the instructions to this? This is so much better than the original!